We are in the process of building a 60' long x 8' wide x 12' high green house out of tinted ( smoke) double walled polycarbonate on a cedar deck with drainage systems, insulated, heated, cooled and such. 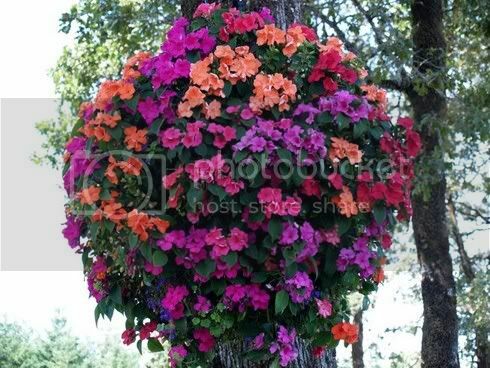 Every year we spend $3500 in annuals and azealeas that don't make it as well as 10 Mac Baskets ( giant hanging baskets approx. 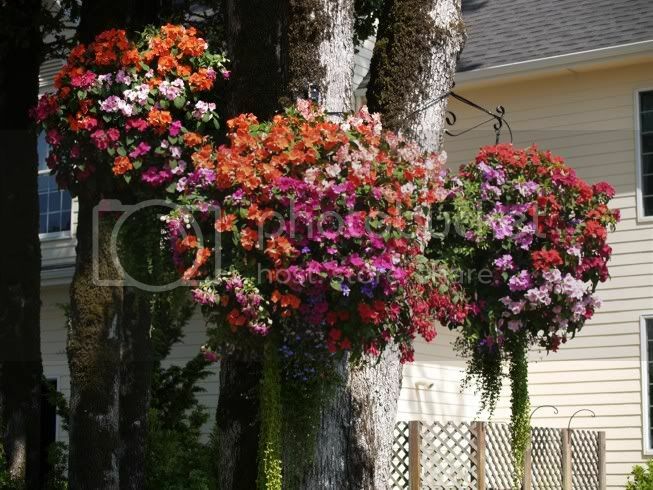 6' tall and 6' wide with impatiens, Wave petunias and Creeping Charlie type trails named after the town of McMinville Oregon that has these on every lamp post in town) we also plant around 300 white impatiens yearly. This year was a VERY hard year to find 300 white impatiens and they were $3 a piece when we did, The Mac Baskets are getting less professional looking as the grower has now became huge and seems to care more about quantity than quality these days. Will any of these live through the winter in a heated (grow lighted) greenhouse? Or do all annuals just die after so long? Can we get seeds or start new plants by cutting the old one somehow? Most of the plants are massive by now and I am guessing the baskets just get too rootbound to flourish or is this not true? WOW!! Those baskets are beautiful. I start my own impatien seeds in late February. I do not have a heated greenhouse, so the seeds are started on a heated grow mat. Once they sprout and have first leaves, I take them off the mat. They stay under grow lights until it is okay for them to go into the greenhouse. I guess you could try taking the baskets into the heated greenhouse and see how they make out. An annual is supposed to live until it sets its seed and then die. Maybed with regular deadheading you could coax some extra life out to them. so will the impatiens seed? I am guessing we would have to pull them before frost and collect the seeds somehow? Where would you look for seeds? I am guessing we have over 1000 impatiens between all of the baskets and ground cover and it would be nice to keep this years variety since they grew so large and had really nice leaves. my grandma is a magic worker, I don't know what type of annual it was, but when it died she just crushed up it's leaves and mixed in in with the dirt (the plant is in a pot) and it came back the next year. On the wave petunias, look where a flower was and you will see a teardrop shaped head. Allow those to dry to a light brown color and clip that off the plant. Then with the teardrop over a papertowel or something else to catch the seeds, break it open. Store the seeds in an airtight container in a cool area until you are ready to plant them. They will be tiny, so when you plant them, simply sprinkle them over the soil and LIGHTLY tamp the soil with your palm. I always water from the bottom when the soil starts to dry out and I have not had any problems with dampening off since. I checked my impatiens and it looks like that tiny green head in the center of the flowers contains the seeds. I never tried collecting impatiens so I don't know when to tell you to clip it off except for when it starts to lose its green color and dry out. Store and plant the same as the petunias, but try to give the impatiens warmer soil with either a grow mat or on a floor heat vent(I used one until I got the mat and it did work). I read the post before mine, and crushing the entire plant into the soil will work because you are also crushing the seed heads into the soil. My only word of caution here is if the plant has any diseases, you are then putting them back into the soil also. When your impatiens seeds are ripe they'll fire off in all directions and if you listen carefully you can actually hear the crack as they do it! Hence the name impatiens...they're impatient to set the seed! They're also known as 'touch-me-nots'. If you want to collect the seed, maybe you should bag the plant up in some way so that you can catch it. I'm going to bag one or two that are in a hidden corner so my mom doesn't think I'm cracking up when she comes to visit. decam0 wrote: When your impatiens seeds are ripe they'll fire off in all directions and if you listen carefully you can actually hear the crack as they do it! Hence the name impatiens...they're impatient to set the seed! They're also known as 'touch-me-nots'. Does this happens once, or is this a continuous thing through the year? Or is it near the end of fall? bit off topic, as this is not about starting seed indoors. but for several years i planted impatients around our place. however in the past two years i've let the perennials take over the gardens. Also in these past two years the areas of previous impatient beds have impatients coming up from seeds. At this time of year they begin to have a beautiful 'show' ,, ,because it take s a while for them to get started in the spring and summer. i just let them grow there they please,, I'm so glad they come up!!! we live in Michigan,, zone 5... impatients die with the first frost around here. Yet they reseed themselves, the new floors are true to color and come up as new plants. not from root. If the blooms are pollenated, they will set seed, ripen and eject the seeds to make new plants where the seeds land. This won't happen to your plants because you probably dead-head regularly to extend the flowering period. But they will set seed throughout the season if left to their own devices.